Dive into the ultimate gift guide for every wine lover to discover the best presents that will complete any wine drinking experiences. We have covered just about everything a wine lover could want. From wine pearls to on the go coolers and unique wine holders, each of these products would be a hit for any birthday, Christmas, anniversary, or special occasion gifting. The ultimate gift guide for every wine lover covers the out of the box ideas that you wouldn't think of, but your wine lover will truly appreciate. From funny gag gifts to helpful wine accessories, we've got it all. To start off our ultimate gift guide for every wine lover, let's imagine ourselves on the beach. What better way to take in the sun than with a glass of wine in your hand? The Beach Glass makes this experience 10 times easier. Designed to sink straight into the sand, this acrylic glass will hold your drink upright all afternoon. If your wine lover isn't a beach person, then this glass can also be used in the grass for a picnic, or even in the sand after slaving away at their snowman. Replace their red solo cups with a reusable, classy looking glass that can be used over and over again. As one of the coolest wine glasses every made, they won't make a trip to the beach without one. If you're looking for an out of the box idea to gift your wine lover, Uncommon Goods is a great place to start. Created by Uncommon Goods user Michael Leibowitz, this wine preserver bottle is just one of the many great items on the website we're going to suggest. So, why a wine preserver? This is a great gift for your friends who have bigger eyes than their stomach. If they can never finish off a bottle, even with some help, this is a great gift. The preserver bottle can hold up to 750 ml and is simple to use. Just pour the wine in the bottle, and seal it closed with the float, which will create a barrier between the wine and oxygen. This is of course a bit more of a gag gift, but it's not actually what you think. As one of the most interesting items on our gift guide for every wine lover, the wine condom creates a tight seal on the wine bottle. In replacement of a wine stopper, the wine condom is the solution to an unfinished bottle of wine. Though you might purchase this for a laugh, they are actually a great concept. Tell your wine lover to wrap up the best date night wines after a night full of great wine and great fun. Wine pearls sound pretty elegant, don't they? The pearls are innovative wine chillers that will keep your white or rosé wine cool all night long. Unlike typical ice cubes, you won't have to worry about these pearls watering down your wine. But like ice cubes, the more pearls you add, the frostier your drink will get. But what sets them aside from other chillers? They are called "Pearls" due to their oval shape. Created to fit effortlessly in a round-bottomed glass, the pearls will pile up in the glass without taking up too much space. So this means more room for wine. This would be a great gift to give in collaboration with the beach wine glasses. An on the go wine cooler is an essential for any outdoor drinking this summer. If your wine lover also loves to picnic, this cooler will be perfect to throw in their bag. Keeping whatever bottle of wine they want chilled, the cooler also keeps it safe and secure with its cushioned interior. Created with stainless steel, the wine cooler is sleek and simple. Plus, it even comes with its own carrying case. The cooler guarantees a cool bottle for up to 12 hours. And as one of the most useful presents on our gift guide for every wine lover, we're sure you've already added this to your cart. A wine decanter might seem like a basic gift to give a wine enthusiast, but this isn't any ordinary glassware. The decanter is hand blown using crystal glass. With a modern yet elegant look, the decanter is sure to add radiance to any room. Amp up your wine lover's glassware with this gift. Plus, they might be more inclined to host parties at their place, to show off a bit to their guests. Furniture is always a tough gift to give. You never truly can capture their personality or decor preferences if you just walk into an Ikea. But, if you chose to incorporate one of their other interests, you might be sold. This is a recycled wine barrel side table. We can't get much cooler than that. It looks sleek, old-fashioned, yet unique. Plus, it's not too large or loud for a simple addition to their home decor. As one of our personal favorite options on our gift guide for every wine lover, this is a bit of a splurge, but worth every penny. If you're looking for unique, this is it. We have to admit this design isn't for everyone. But if your friend would like this, you would know right away. As an adorable handmade dinosaur wine holder, place this little monster on your tabletop as a conversation starter. As one of the most interesting presents on our gift guide for every wine lover, this little dinosaur is equipped to hold any of your favorite wines. And the best part? The head of the dinosaur is the wine cork; adorable! Another piece of home decor, throw pillows are always are a great option for a gift. You can never have enough pillows, honestly. You can purchase this in three different sizes, depending on how serious their love for wine really is. Made from 100 percent spun polyester poplin fabric, this pillow says "Coffee keeps me going until it's time for wine." This is the perfect pillow to say, "I'm just waiting on five o'clock." Wine Wipes might sound a bit extensive. But for a true wine enthusiast, this is perfect. Something most wine lovers might not even think about, these wipes are meant to remove any stains from your teeth from drinking red wine. The wipes are used to remove the red and protect the enamel from any acids in the wine. This gift will alet your wine lover to drink red wine guilt-free. This would work great as a stocking stuffer! The gift guide for every wine lover wouldn't be complete without some wine wipes. Who knew there were so many picnic accessories for wine? Whether you're looking for a wine tote to bring on the beach, on a quick hike, or to the park, this Sunset Wine Tote has got you covered. The perfect romantic outing companion, you'd be surprised how much you can fit into this little pouch. The tote includes two glasses, blue and white checkered napkins, a waiter's tool with corkscrew, and a separate compartment to insulate your wine at the best temperature. Throw it over your shoulder, and you're ready for an afternoon full of fun. Graf Lantz has some instantly recognizable bags. And with their minimalistic signature look, the block felt and leather construction can be recognized anywhere. Their wine carrier is no exception. As one of the most luxurious gifts on our ultimate gift guide for every wine lover, this is an item most wine lovers would drool over. Thinking outside of the box, this carrier is something that your friend or family member might dream of splurging on, but would never buy for themselves. That's where you come in. It'll last them a lifetime. And what better bag to gift than the one that holds their most prized possessions? If you're seriously in trouble looking for a gift, a book is always a great way to go. Wine Folly is one of the most popular websites for all wine knowledge. Founded in October of 2011 by Madeline Puckette and Justin Hammack, the company published an education wine blog with video, infographics, and articles all about wine, as a way to simplify the world of wine. And in an even simpler form, their book, Wine Folly: The Essential Guide to Wine was published in 2015. As a guide to every question you could possibly have about wine, this book is perfect for the wine aficionado in your life. Maybe you can even learn about the healthiest wines to drink! Help your wine lover express their appreciation for wine even in the details of their bathroom. As a great gift for those you wine with, everyone can appreciate a new set of towels. As one of the top options on our gift guide for every wine lover, this towel set has some amusing quotes about drinking, wine, and everything in between, all from famous figures. Our favorite is, "I have taken more out of alcohol than what alcohol has taken out of me" by Winston Churchill. The Wine Aerator by Aervana is a red wine lover's dream. All you need to do is attach the straw the to the body of the Aervana, and insert a few batteries. Then, you will place the Arvada into the open bottle of red wine, and press a single button, Soon, you will smell a "rich bouquet of flavor." As a simple yet thoughtful gift on our gift guide for every wine lover, we can guarantee this will be put to good use. This glass decants your favorite wine for you, with no skills needed. Due to its unique design, the stemless fountain glass is designed to aerate your wine to perfection. Your friend will appreciate the fact that this glass opens up a wine when poured directly into the glass. If they're tired of decanting a bottle, this is the perfect solution. Plus, it looks super cool! If they can also appreciate a glass of whiskey, this is also an alternative to chilling the drink without watering it down with ice. Help your wine lover protect their bottle against oxidation. This air cork is one of the handiest gifts on our gift guide for every wine lover, designed to preserve your wine. Plus, it also doubles as a decorative piece, featuring a grape cluster as the pump. To use, you will simply lower the balloon into the bottle, and give the grapes a few pumps until it expands to the size of the bottle. Now, you have an airtight atmosphere for any leftover wine. We suggest this wine and beer opener as an extra gift you could throw into your presents. This is a great gift to give because its practical and different from anything they already have. Make of stainless steel, you will simply unfold the corkscrew from its loop, and open the bottle in a few seconds. Pair this present with a bottle of their favorite wine, and you're set. Make entertaining easy with such a simple yet innovative opener like this. We've decided that every wine lover needs a pair of these in their bathtub. These wine glass cupholders are made of acrylic plastic with a super strong suction cup, meant to be attached to the side of your bathtub. However, you can also attach this to the side of your jacuzzi, pool, or really anywhere you'd like, to avoid spilling. And be sure to get the pair of two, so you and your friend can enjoy a glass in the hot tub together. We couldn't create the ultimate gift guide for every wine lover without mentioning a winemaking kit. However, this isn't your typical kit. Created by Brooklyn brewers, Erica Shea and Stephen Valand, they created this kit specifically for creating sparkling wine. This kit is easy to use and designed for beginners. Providing everything you'll need, besides the champagne bottles, you can create up to five 750 mL bottles of sparkling wine with this kit. This includes chardonnay grape juice, sparkling wine yeast, a glass fermentation jug, a racking cane, a tubing clamp, cleanser, tubing, hydrometer, screw-cap stopper, five corks, give wire cages, and a one-gallon jug. If Wine Folly's book wasn't in depth enough for your wine enthusiast, this book will do the trick. As an ultimate guide to wine on the ultimate gift guide for every wine lover, this book has everything you could possibly need to know about you and your friend's favorite drink. In the seventh edition of the atlas, The World Atlas of Wine reflects on the changing nature of the wine world. Cork Dork is a New York Times bestseller. Don't worry, this is our last book suggestion on our gift guide for every wine lover, but it's worth the consideration. This book is perfect for anyone who is even slightly curious about wine, let alone a wine enthusiast. The book explored every bit of curiosity you might have about wine and its tastes, its history, and its world. Is your wine lover someone who has to be unique in everything they do, especially when it comes to their favorite things? Well, this is a great way to spice up their wine carrying, something we're sure they do on a weekly basis. However, this product allows you to attach the bottle to your bike! The carrier is a leather bicycle wine carrier, made all the way in Milwaukee, from fully grained leather. It is the perfect protector of your wine bottle while looking unique and stylish. Simply secure the bottle to the top tube of your bicycle, and you're good to go. We know these might seem like just a gag gift, but they might just steal the show of the gift opening. Drinking buddies include five speedo-clad muscle men who have one job: to mark your drinks. They even have names! Brad, Chad, Josh, Ryan, Cody, and Mitch all hook onto the edge of your glass, do you'll never lose track of your drink again. Make entertaining fun and easy with these little helpers. 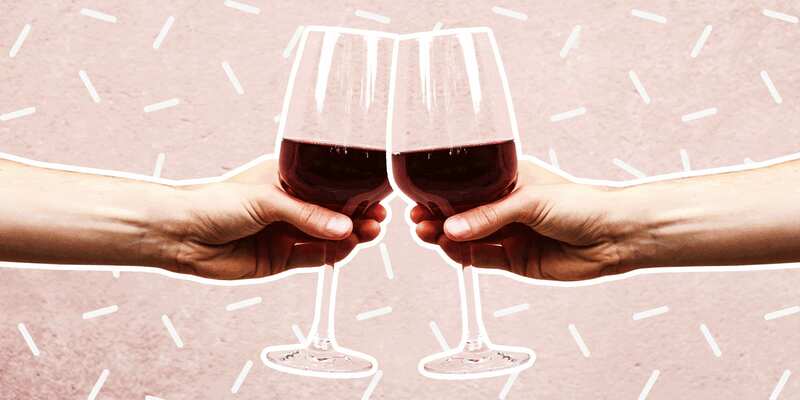 As one of the best gifts for a bachelorette party on our gift guide for every wine lover, any girls night in will be a hit with the addition of these six handsome men. This product has the theme of both coffee and wine, much like our pillow set we suggested, but this takes the duo one step further. Merlot infused coffee is something that will perk up any wine lover's ears. Though we have to squash your hopes just a little and remind you that this coffee contains no alcohol, it still maintains a merlot taste. With merlot-infused beans, this will be the go-to after-dinner brew for your wine lover. What would be a gift guide for every wine lover without mentioning a gift set? The set includes a charming slider box with reveals to larger clear cubes, one contains a large cube of But Fire, the other, Rose Gummy Roses, two types of rose-flavored candy. However, the downside is that the gummy bears do not contain any actual alcohol, just the taste. So if you're looking to please your wine lover's palette without actually involving alcohol, this is the perfect opportunity. Wine in a mug? What might not be your typical first choice of wine drinkware, giving your wine lover a mug mixes things up a little. With the phrase, "Coffee, JK This Is Totally Wine" on the side of the mug, your wine lover's secret might be exposed, but they'll rock it anyway. Of course, they can drink coffee in the mug, as well as tea or any other beverage of their choice, when they're feeling like expanding outside of the world of wine. We promise this is our last home decor on our gift guide for every wine lover, but we couldn't neglect adding it, because it's just so cute. Allow a helpful elephant to hold your wine bottles. As a fun and unique way to store wine, this elephant will please any wine lover. Or, you could even use this little elephant as a hand towel holder, if you want to think outside of the box. Even better, you can add those wine towels with this gift, for a complete package. This is not your ordinary wine chiller. The corkcicle is an award winning item, designed by Eric Miller from the MoMA Design Store. The concept is simple, but the first of its kind, attached to the cork is a long, icicle shaped cooler. Simply slip the device into the bottle, and the corkcicle will do its magic. Maintaining chilled white wines cool and cooling room temperature reds, this will come in handy for any of your favorite bottles.